Click here for a sample of ANC053. Given there is no language that can translate an invisible hurt / Prove the creation of a separate self neither addressed nor acknowledged. Of the Platonic solids, the cube’s sturdy simplicity most enchants geometer and novice alike. The structure’s elegance lies in the regularity of its proportions: six like sides, twelve equal edges, eight symmetrical vertices. Manipulating its volume reveals seemingly limitless formulary relationships, but none more significant than the figure’s role as a measure of all three-dimensional Euclidean space. Building upon the prism’s form, Hugo Lövheim offers a theoretical model of emotion by extending three primary neurotransmitters from a single vertex and placing fundamental feelings in its eight corners. Moving along its axes, combinations of these chemicals produce specific moods. For example, low levels of serotonin and dopamine with an excess of noradrenaline results in anguish; reversed coordinates bring enjoyment. If these cubic representations were to tessellate limitlessly outward, at what point would their composition equal the volume of a body’s resistance when it is told it does not deserve to be erased? In Stereometry, Mercedes Lucero adopts arithmetic’s orderliness to manage her grief following a period of loss and near loss. This poetic curriculum articulates the solace she found in poring over textbook equations and theorems, seeking to merge the impossibility of knowing why with a discipline built upon solutions and answers. Lucero employs logic and reason in her focus on the abstract principles governing heartache. Which rule calculates the area of uncertainty? The shape of evaporating water? The distance between mourning and remembering? In surveying personal distress, she provides new means to assess the universal. 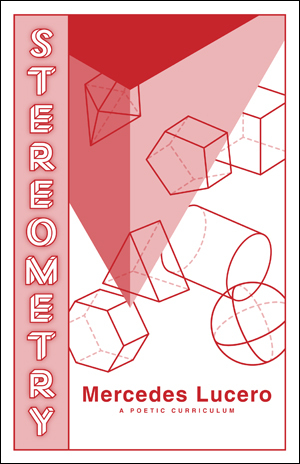 Stereometry is bundled with interactive elements inviting reader participation, sharing an opportunity to quantify experiences beyond our understanding.